They say the shortest distance between two points is a straight line, but for JUICE—a European Space Agency-led, Jupiter-bound probe scheduled to launch in 2022—the quickest route will involve a rather convoluted journey requiring four gravitational assists with three different planets. Announced back in 2012, the Jupiter Icy Moons Explorer, or JUICE, is set to launch in June 2022 from Kourou in French Guiana . 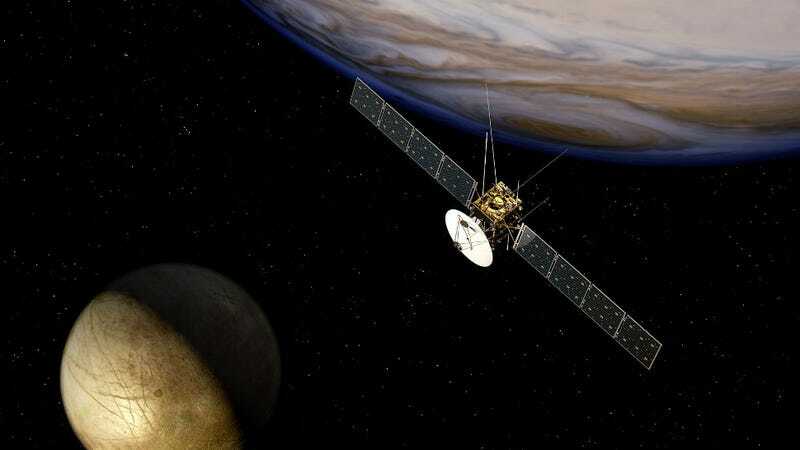 The spacecraft will arrive at Jupiter after a seven year journey, where for 3.5 years its 10 state-of-the-art instruments will explore the gas giant’s turbulent atmosphere, enormous magnetosphere, its nearly-invisible rings, and its satellites. At the end of the mission, JUICE will enter into the orbit of Ganymede, and become the first spacecraft to orbit a natural satellite other than the Earth’s moon. JUICE represents Europe’s first mission to Jupiter, or any of the Solar System’s outer planets for that matter. Currently, NASA’s Juno space probe is orbiting Jupiter, but it’s focusing exclusively on the gas giant, scanning the planet’s composition, gravity field, magnetic field, and magnetosophere. JUICE will also study Jupiter’s atmosphere, but it’s also going to take a look at its icy moons—Ganymede, Europa and Callisto. These moons are thought to harbour subsurface oceans—and possibly even habitable environments. But before any of this pioneering exploration work can happen, JUICE is going to have to make a series of tricky maneuvers to get there. Once JUICE arrives at the Jovian system (in October 2029), it will have to perform even more gravitational assists, but these moon-to-moon assists (as many as 25! ), involving Ganymede and Callisto, are designed to slow down and orient the orbiter.